In May of 1635, a small group of immigrants rowed from Ipswich to the mouth of the Parker River and landed on the north shore east of the present Parker River bridge. Tradition states that young Nicholas Noyes was the first person to leap ashore when their boat anchored in the Quascacumquen (now the Parker) River. This family history of the NOYES surname and collateral families is an ongoing 64 year effort to combine various source materials into one centralized repository for this historically famous family. My work originally was based on the two-volume set by Col. Henry E. Noyes--"Genealogical Record of Some of the Noyes Descendants of James, Nicholas and Peter Noyes", published in 1904. Although the entire work of Col. Noyes is included in this database, nearly 1,000 additional sources have been added over the years with literally thousands of citations to these various sources. The Noyes Genealogy is, by no means complete; however, this site is dedicated to sharing what has been pieced together to date. If you find material that may be useful in your research, please feel free to use any pertinent information. Any corrections and additions to the data contained on these pages would be most appreciated. Ancient Noyes Family History The surname NOYES is rare. It may have originated in East Anglia at a very early period. Cholderton Village The register of the Diocese shows that Rev. William Noyes officiated in the Cholderton Parish from 1602 to 1620, at which time he resigned. In 1621, he was succeeded as rector by his son Nathan. The Anne Parker - Anne Stephens Controversy Analysis regarding the Anne Parker - Anne Stephens Controversy. 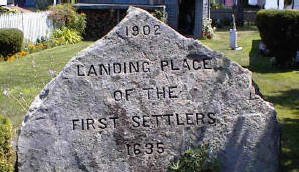 First Settlers Landing Place "Ould Newbury": Historical and Biographical Sketches by John J. Currier (1896), Damrell and Upham, Boston.